Australia offers a bit of heaven here on earth in a place aptly called Surfers Paradise, the haven for the adventurous or families who seek the beach, rolling waves and appreciate nature. And of the hundreds of resorts and apartments that dot Surfers Paradise, Anacapri budget apartments Surfers Paradise stand out as the ideal nest to relax on your Surfers Paradise, Australian holiday. Anacapri Surfers Paradise family accommodation stands so close to the golden beaches and food and leisure establishments of Surfers Paradise, where the festive sun shines amidst the fun and enjoyment exuding from every night club, bar, cafe, restaurant and mall in Surfers Paradise. 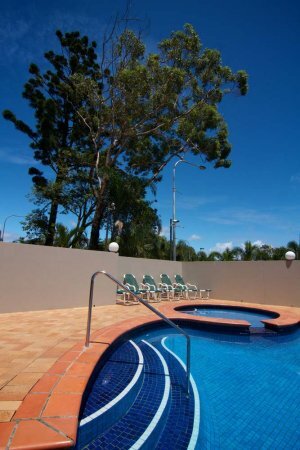 Our budget apartments Surfers Paradise caters well for the family or group, and so, with all its amenities, Anacapri 2 bedroom apartments Surfers Paradise ensures that families, groups and couples will get the chance to relax and enjoy the day even without leaving the comfortable apartments. A sauna is also one important feature of the holiday apartments, and visitors will get the choice to spend some healthy moments sweating and savoring the therapeutic effects of sauna. Food is served like a feast for their own at a comfortable alfresco dining area. Sports buffs need not look any farther to satisfy their athleticism, since these holiday accommodation apartments has its own gym and tennis court, perfect places to tone up and keep fit on your Surfers Paradise holiday. Lastly, visitors need not worry about all the nitty-gritty details that can kill much well-deserved holiday time. The Anacapri Tour Desk can take care of the details of the whole holiday, including scheduling the places to visit, hiring transportation for tours, booking cruises and procuring theme parks tickets. They can also arrange airport transfers for the visitors.